CHICAGO, Ill., June 28, 2011 (SEND2PRESS NEWSWIRE) — KnowledgeAdvisors, a leading provider of learning measurement software that improves the effectiveness and business impact of learning, has announced it has released a brand new whitepaper (i) focusing on executive reporting needs based on survey research and (ii) providing insight on how they are accordingly met with KnowledgeAdvisors unique approach, Talent Development Reporting Principles. In order to understand the executive reporting needs across the industry, KnowledgeAdvisors recently sent a survey to over 5,000 people from 1,500 organizations to gather their feedback about executive reporting needs. – Among the respondents we surveyed, 73% indicate that L&D leaders want to demonstrate the link between learning and business impact. – A large majority (75.4%) of respondents believe that business leaders need better, more comprehensive information about the effectiveness of the L&D function. – Only 36.1% of respondents believe the executive reporting process for L&D information aligns well with the strategic goals of the organization. – Only 18.5% of respondents believe business leaders know what to ask for to demonstrate effectiveness of L&D efforts. – One-third (33.9%) use scorecards and dashboards to communicate the effectiveness of L&D. “L&D and other HR leaders often wonder why they do not have a seat at the table with the C-suite for strategic planning meetings. Based on the results of our survey, only 55 percent of L&D leaders are well connected to business leaders and only 31.25 percent actually have a seat a the table. One answer is that L&D often does not have information about the L&D organization that is deemed valuable. Efficiency information is not sufficient to convey the value of training because it mainly explains activity and cost. Effectiveness information is often confusing and does not translate quickly and easily to business metrics. Lastly, business outcomes often resonate with leaders, but they are difficult to obtain and more difficult to tie back to training,” stated Kent Barnett, CEO of KnowledgeAdvisors. Talent Development Reporting Principles is crucial because first, it aligns information with the business needs, provides a standard set of metrics that meet executives’ information needs, and it can be displayed in tabular or converted to graphics in a dashboard format. Second, the TDR provides standard metrics that allow for comparisons across other organizations that use the same format. Lastly, the utility of the information helps get L&D a seat at the executive table because the TDR provides business information (costs, effectiveness and outcomes) that help executives make decisions about L&D investments. The survey results from KnowledgeAdvisors’ most recent research indicates that there is an information void that needs to be filled for L&D and business executives. Filling that void is likely to be an entree to the executive table. KnowledgeAdvisors offers clients the Talent Development Reporting Principles (TDR) as a way of creating a standard set of reports for L&D. The reports contain all the information (efficiency, effectiveness and outcomes) that is relevant to the C-suite, packaged in a way that is easy to review and understand at the executive level. 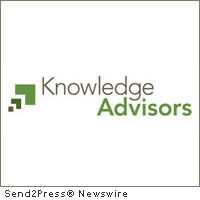 Organizations interested in further details about this research can access the complimentary white paper found at: http://www.knowledgeadvisors.com/media-research/white-papers/research-executive-reporting/ and access the TDRP dedicated resources page at: http://www.knowledgeadvisors.com/tdrp . Original Keywords: whitepaper, learning measurement software, Knowledge Advisors, Talent Development Reporting Principles, Chicago Illinois business news, human resources, HR KnowledgeAdvisors Chicago Illinois CHICAGO, Ill.
REFERENCES: Business News, whitepaper, learning measurement software, Knowledge Advisors, Talent Development Reporting Principles, Chicago Illinois business news, human resources, HR KnowledgeAdvisors Chicago Illinois CHICAGO, Ill.